German watchmaker MeisterSinger expanded its No.02, Pangaea and Neo model lines with a variation in its own distinctive dark sunburst green. 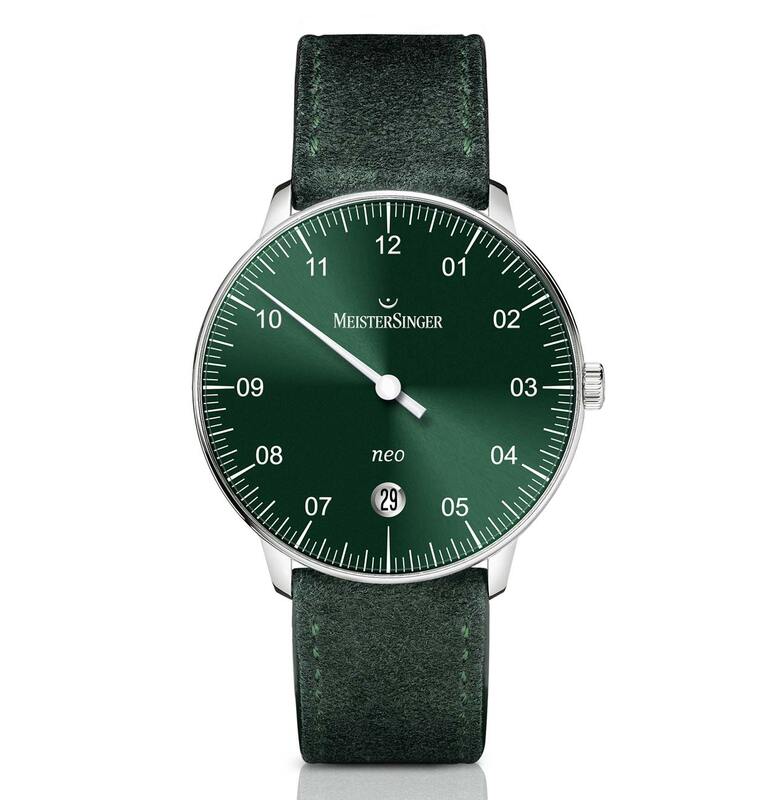 The Rensing in the name refers to Nico Rensing, a member of MeisterSinger’s sales team who had the idea for this deep, sunburst green dial which shimmers when it catches the light. 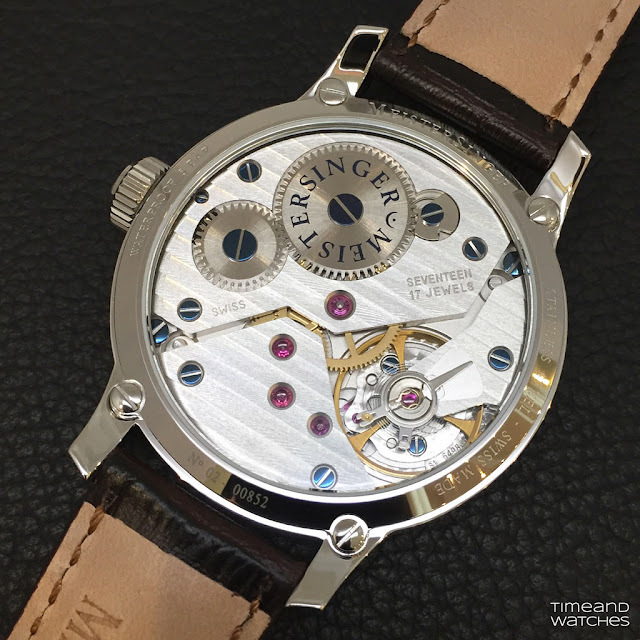 The colour was first used in 2015 in the Salthora Meta jumping hour model whose success suggested MeisterSinger to offer this colour in other lines. The MeisterSinger No.02 Rensing Green features the new applied double-digit hour markers giving the dial a modern graphic look which enhances the legibility of the time. White index markers, steel digits and a white hour hand add the necessary contrast. The 43 mm stainless steel case, water resistant to 5 bars, houses the Swiss hand-wound movement Unitas 6468-1 offering 46-hour power reserve. The beautiful movement can be viewed through a glass exhibition base affixed with screws. Completed by a croco print calfskin strap in gray, the MeisterSinger No.02 Rensing Green has a retail price of Euro 1,998. With its slimmer case (40 mm) and serifed hour markers, the Pangaea is one of the most elegant timepieces in the MeisterSinger collection. Also in stainless steel, the Pangaea Rensing Green is powered by a Swiss automatic movement (ETA 2892-2 or Sellita SW300-1) with 42 hours of power reserve. Price: Euro 1,949. Finally, there is a Rensing Green version also for the vintage-styled Neo, featuring a 36 mm stainless steel case with a thin bezel and curved Hesalite glass. Thanks to the thin plastic glass, the Neo is only 9.7 mm high. The time-keeping accuracy of the Neo is ensured by the ETA 2824-2 (or Sellita SW 200) automatic movement with 38 hours of power reserve. 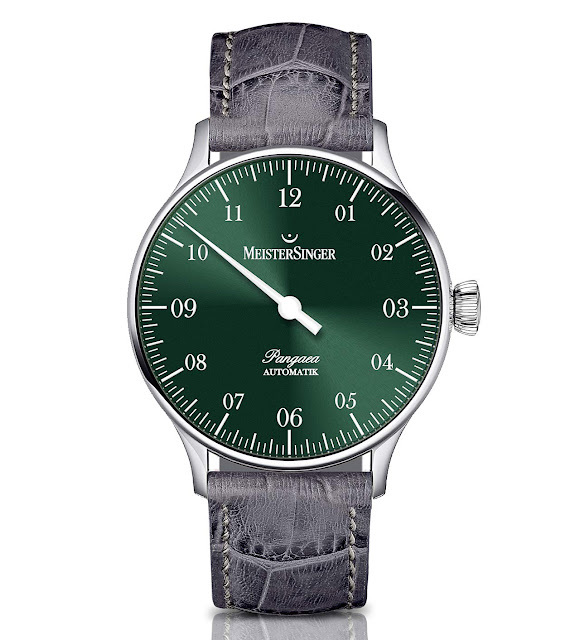 Attractively priced at Euro 998, the MeisterSinger Neo Rensing Green comes with a suede strap in matching green. 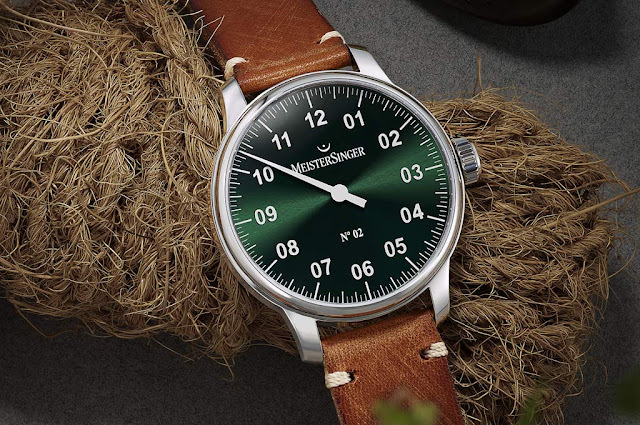 German watchmaker MeisterSinger expanded its No.02, Pangaea and Neo model lines with a variation in its own distinctive dark sunburst green. Completed by a croco print calfskin strap in gray, the MeisterSinger No.02 Rensing Green has a retail price of Euro 1,998. The Pangaea Rensing Green is powered by a Swiss automatic movement (ETA 2892-2 or Sellita SW300-1) with 42 hours of power reserve. Price: Euro 1,949. 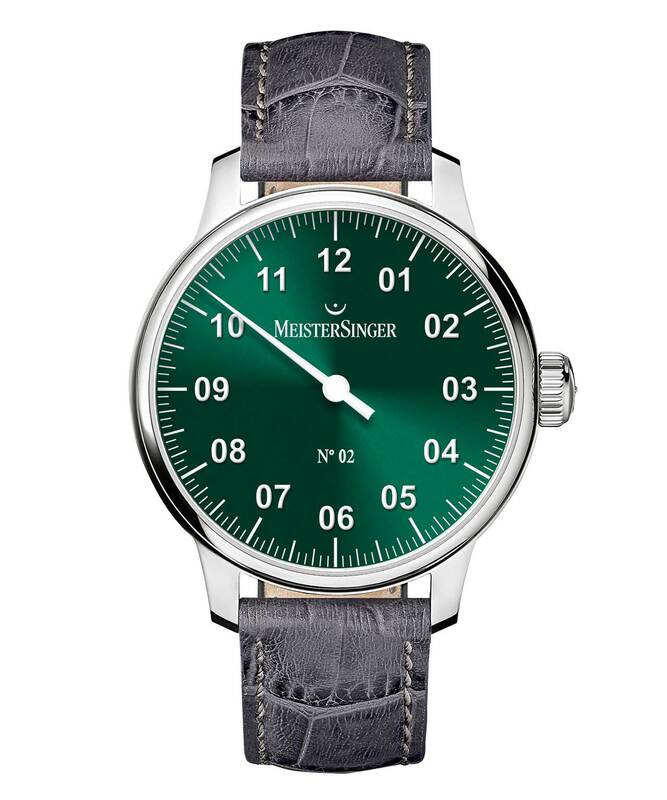 Attractively priced at Euro 998, the MeisterSinger Neo Rensing Green comes with a suede strap in matching green.